Lions Club International officially chartered the Town of Sheboygan Lions Club on June 22, 2003. The Lions Club motto is "WE SERVE". The charter members decided that we use this philosophy to provide our major services and the funds we raise to the Town of Sheboygan Fire Department, Town of Sheboygan First Responders and to the Town of Sheboygan Firehouse Park. To achieve our yearly fundraising goals we hold Brat Frys at Miesfelds, we sell Roses and Flowers for Mother's Day, we sponsor annual Glowball Golf Tournaments at Town and Country Golf Club, and our major fundraiser is Lions Fest, which is held on the first Friday night and Saturday after the 4th of July at Firehouse Park in the Town of Sheboygan. The funds we raise throughout the year'are shared in our community between the following groups: . In our first ten years, our club has raised over $45,000 to be used in the above areas. 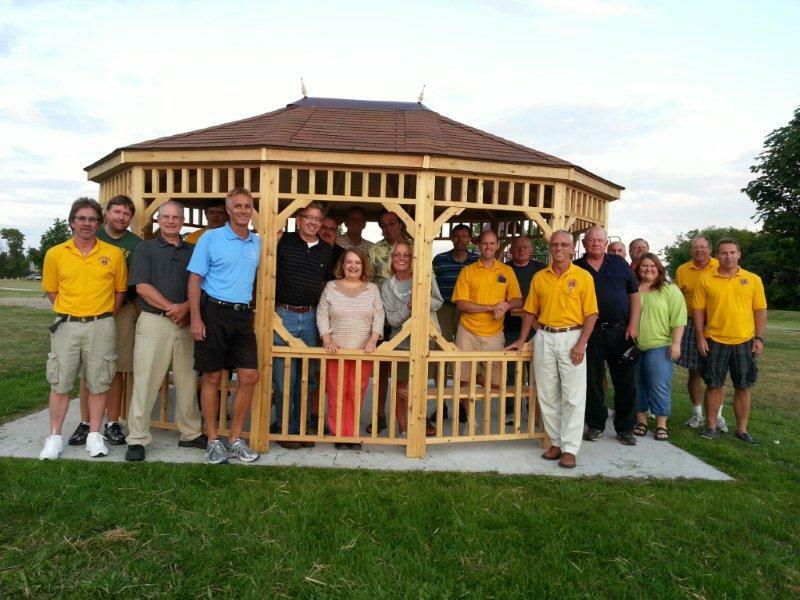 Our 2011 and 2012 Lion's Fest raised enough money for our club to donate a gazebo to the Town of Sheboygan's Firehouse Park for parents to enjoy while their kids play on the playground. (see photo above). We are continually looking for new ways to raise money to improve our community. We welcome anyone who is interested in joining our growing club to attend one of our monthly meetings. We meet at Town and Country Club Restaurant at 6PM on the first Monday of each month. Please feel free to join us and we would be glad to tell you more about the Lions and how "WE SERVE". If you are interested or would like more information, please contact Bob Oonk via email boonk@charter.net.